If you have a tendency to print out a lot of information which you only need temporarily, the PrePeat printer might be just what you need. 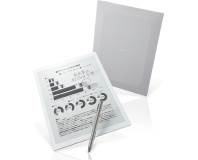 As reported over on Engadget, the PrePeat from Sanwa Newtec uses PET plastic sheets rather than traditional paper, on to which a temporary image can be transferred by the application of heat - in black only for now. Once you're done with your printout, simply feed it back into the printer and it'll erase the image and replace it with a new one. Unlike a traditional printer, the PrePeat doesn't require toner or ink, and the individual sheets are reusable up to 1,000 times before they refuse to take an image. While still in the early stages, the technology holds promise for offices where lots of printouts are required for meetings only for the paper to end up in the shredder in short order. Sadly for anyone hoping to get their hands on a PrePeat, the early models aren't exactly cheap: the printer itself will set you back around ¥500,000 (£3,584) and each sheet will cost ¥300 (£2.15) in units of 1,000 - meaning an initial outlay of ¥800,000 (£5,734) to get you started. Despite this, the low cost-per-page and high durability of the printouts - so long as you keep them away from sources of heat - may make the PrePeat a winner with corporate customers. A video of the unit in action, made by DigInfo.tv, can be found on YouTube. Can you see a use for temporary printouts, or does the cost need to come down before you'd be interested? Share your thoughts over in the forums. A year to the day, oddly enough. Expect more electronic paper soon.